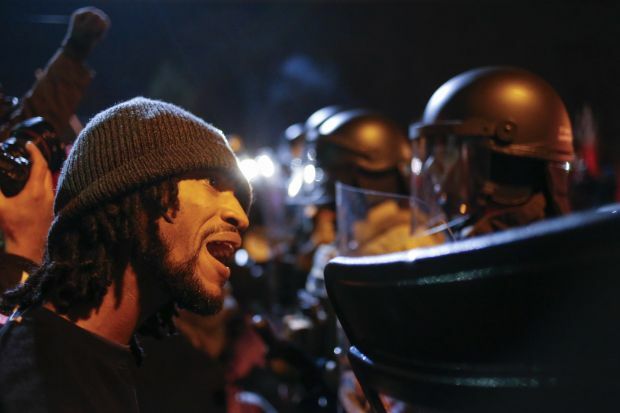 WASHINGTON (CNS) — The scenes of chaos and violence in Ferguson, Missouri, Nov. 24 following the grand jury’s decision not to indict the white police officer in the shooting death of Michael Brown, an African-American teenager, reveal deeper issues going on in the country, said one of the country’s black Catholic bishops. The smashed windows, lootings, car and building fires when the grand jury’s decision was announced were “part of a cycle of violence that is going to continue spiraling,” he added. “We need to rekindle that commitment and not be so silent and only react when there is a great tragedy that forces us to,” he said Nov. 25 from St. Joseph’s Seminary in Washington where he is rector for the Josephites, the order founded to serve newly freed slaves in the United States and now ministers in African-American communities. The bishop noted that many church leaders were at the forefront in integrating schools and fighting against racial discrimination in the 1950s and ’60s. Bishop Ricard, who grew up in the segregated South in Baton Rouge, Louisiana, and was a seminarian in Washington when the Civil Rights Act passed, does not have a simple reason for why the church has not been as outspoken in recent years but he thinks complacency is partly to blame. “People throw up their hands in air when there aren’t clear solutions or they are distracted by other things going on,” he told Catholic News Service. What he would like to see happen in the wake of the Ferguson decision and reaction is for parishes or dioceses to convene to discuss racism. Because as he sees it, these types of violent situations and reactions will continue “and if anything, get worse” if nothing is done.